Mesh-current analysis (loop-current analysis) can help reduce the number of equations you must solve during circuit analysis. Mesh-current analysis is simply Kircholff’s voltage law adapted for circuits that have many devices connected in multiple loops. This section walks you through mesh-current analysis when you have two equations, one for Mesh A and one for Mesh B. In the sample circuit shown here, both meshes have a clockwise current. The preceding equation has the form Ax = b, where matrix A is the coefficients of resistors, x is a vector of unknown mesh currents, and b is a vector of independent voltage sources. The preceding device voltages make sense because they satisfy KVL for each mesh. You can apply mesh-current analysis when dealing with circuits that have three or more meshes. The process is the same as for circuits with only two mesh currents. Consider this sample circuit, which shows voltages and currents for each of the devices as well as the mesh currents iA, iB, and iC. Notice that all the mesh currents flow clockwise. Notice that in the resistor matrix, the main-diagonal values are all positive, the off-diagonal values are all negative or zero, and the off-diagonal values are symmetric. For a circuit with an independent source, that symmetry with respect to the main diagonal is a good sign that you’ve set up the problem correctly. 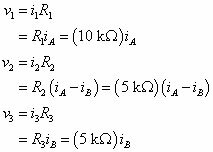 The preceding results make sense because they satisfy the KVL equations for the three meshes.